Grammy's Attic: Birthday Cheers ! Such an adorable Birthday card!! Cute card for a birthday! Love the design and that bit of ribbon. Of course the tiny bow tops it off perfect. This is gorgeous, love the image and the design. Lovely card! I like the ribbon around the cardpanel as an added element. Too cute, NC!! Thanks, as always, for sharing it with us at PIP Challenges!! What a great image! You have co!I used her perfectly. Thanks for joining our birthday blog hop challenge at CRAFT. Brilliant card and thanks for sharing with us at Crafty Catz this week dont forget we have a GDT call for June running. Good luck in the challenge. very cute birthday card -thanks for joining us at Lemon Shortbread! Super image, of course beautifully coloured, with a beautiful die frame, you have super dies Connie. A really sweet card!! I love the focal image! So cute and beautifully coloured! 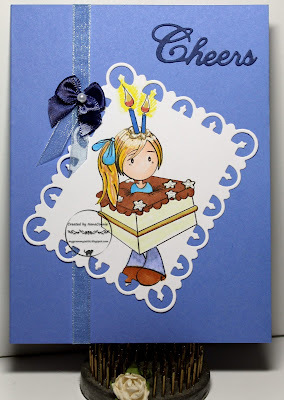 Thank you for playing along with our No Patterned Paper Challenge at Crafty Cardmakers.